Thanks to a backpack-sized power supply, surgeons at the University of Michigan Frankel Cardiovascular Center sent a patient waiting for a heart transplant back home. 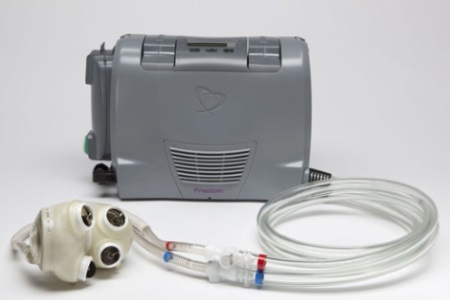 Cardiac surgeons implanted a total artificial heart powered by a portable driver, allowing the patient to return home without receiving a transplant. Many millions of Americans live with varying degrees of heart failure. More advanced cases are accompanied by symptoms of shortness of breath, even when a patient is at rest. Several options exist to manage heart failure, including medications, lifestyle changes, and certain heart procedures, but when these fail, more drastic measures must be taken. Sometimes these measures include ventricular assist devices to help the ailing organ perform while a patient waits for a transplant. Oftentimes the left ventricle is supported by a ventricular assist device, but when both sides of the heart begin to fail, a total artificial heart must be used. This was the treatment approach doctors at the University of Michigan decided to take for Stan Larkin, a 24-year-old patient from Ypsilanti, Michigan, according to a recent press release. Suffering from an inherited form of heart disease called cardiomyopathy, Larkin found out he had the disease when he suffered a heart attack while attending a basketball game. Evaluation of the rest of his family revealed that his younger brother also suffers from the disease. After receiving the SynCardia temporary Total Artificial Heart (TAH), Stan was outfitted with the Freedom Driver, which is a portable, 13-pound power supply, according to the press release. The TAH Larkin has is called a bridge treatment, which is designed to hold him over until a transplantable organ becomes available. The Freedom Driver was only recently approved by the FDA, according to a recent story on Med Device Online. Historically, patients with TAHs were required to wait in the hospital for their transplants, a process that can take months and sometimes years. The device powers the TAH with compressed air. Two tubes exit Stan’s body so they can be connected to the Freedom Driver, according to the press release. Before the Freedom Driver was available, the TAH implants were run by a machine called “Big Blue,” a hospital-based compressed air system the size of a washing machine that weighs in at 418 pounds.